Alex Hales demonstrated why he is a dilemma for the England selectors on an absorbing first day at Lord’s. Ahead of the announcement of the squad for the first Test against Sri Lanka, Hillingdon-born Hales showed several facets of his game in making 73 in a shade under three hours at the home of cricket. 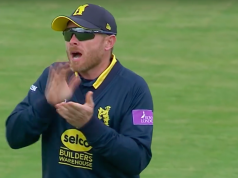 There was a trademark towering six off off-spinner Ollie Rayner and 10 further boundaries. 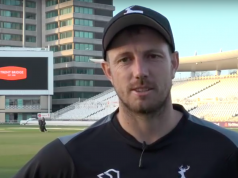 There was some unusually restrained defence too, especially in the wake of losing opening partner Steven Mullaney in the first over of the day after skipper Chris Read had won the toss and opted to bat. So much so he was unusually cast in the role of junior contributor in a century stand with Michael Lumb either side of lunch. And yet it was perhaps that very attempt at restraint or just the lack of concentration to play the really long hand which ultimately proved his undoing. A missed pull hinted at impatience before he drove all round a straight one from Toby Roland-Jones to lose his castle just as the visitors were assuming full command at 168-2. As he departed to warm applause the sense was as the sitting tenant at the top of the order he will probably get the nod to start the series against the men from the sub-continent. At the same time there was a feeling his bent towards aggression had left runs out there which would have clinched the deal. Roland-Jones (3-57) removed Riki Wessells in the same over for a duck to leave Notts four down and when Lumb too missed out on the chance of a century when trapped in front by Rayner just before tea, the hosts briefly threatened to seize the initiative. Steven Finn (2-89), wayward in his first two spells removed both Chris Read (38) and fellow England seamer Chris Broad in a much fierier burst in the final session. However, a mix of aggression and grit from Samit Patel, unbeaten on 86 overnight, has his side just ahead on points heading into Day Two.